When folks start to talking about the whopper that got away, well, when it comes to the whole hog, nothing's going to beat the tale of Big Bill. Raised from the runt of the litter into a 2,552-pound porker, Big Bill continues to hold first place as the largest pig in the universe as validated in the Guinness Book of World Records. But what ever happened to the remains of this Goliath of the swine kingdom proves to be an enigma. 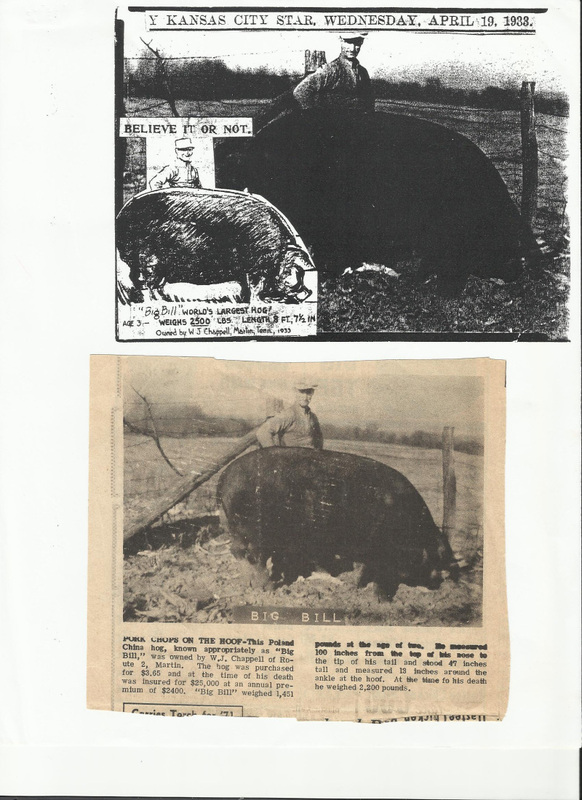 Born and reared in Martin, Tennessee, the Poland China hog died a premature death in 1933 at the age of 3 while en route to the Chicago World's Fair. Poor Bill was then skinned and stuffed, changed hands a couple of times and was last reported to be in the possession of a fellow from Paris, Tenn.
Kerry Butler of Lebanon was born and spent his boyhood years in Jackson. He never saw Big Bill but he heard the tales from his father. "My grandpa [Buford Butler] bought it [Big Bill] and carried it around the country," said Kerry. "As a kid it was kind of a cool thing. I had one uncle who was a world champion duck caller and with the world's largest pig that was my claim to fame. "It was always a big deal for my dad. He grew up traveling with his parents as they showed it. When my grandfather sold it, it just disappeared. There probably would be nothing left of it now." But we may be getting the pig before the cart, so before exploring what happened to the deceased Big Bill let's dig up the facts behind the live Big Bill. Robert Chappell, 92, of Martin, is likely one of the few folks still around who saw Big Bill in the flesh. In fact, he even rode on Bill's back. That's because his father Walter J. Chappell was the Weakley County farmer who raised Bill, a family pet that helped to bring home the bacon. "I was about 8 or 9 or 10 years old when we got him," recollected Chappell, the eleventh-born of 12 children in the family. "Dad traded for him. He was just a runt." Chappell said his father swapped a young, eating-sized hog for the piglet, plus got $3.65 in the deal. "Dad decided, 'Why, I'll just keep 'em and we'll see.' And he was a just increasing all the time. I think he weighed 1,500 or 1,600 pounds and kept a growing. We just fed him general hog stuff, farm food. Dad got to feeding him potatoes and sorghum molasses with a little shorts in with it. He would eat a five-gallon bucket full before we turned around. That's the way it got started," said Robert. Bonnie Tuck, Robert's niece, adds a bit more about the hungry hog's diet, information she was told by her mother, Ruth Chappell Andrews. "There was always a curiosity as to why he got so large. My mother said her dad would go to town on Saturday and purchase a stalk of banana, and they fed him the banana peelings. I guess that's what made him so big," she surmised. Robert continues, saying, "He growed into a monster. My dad went to calling him Bill, and he got so big they added Big to his name. He'd eat anything. "A bunch of us boys, we'd jump up on that hog, and he'd just walk around. We'd just play with him. All of us loved him and thought the world of him," he said of the pig that became their pet. Word of the mammoth-sized oinker spread, and curiosity seekers began to make their way to the Chappell place on weekends. The neighbor suggested the farmer charge a fee. "Daddy took a can and put it on a post, and they filled it up with dimes and quarters. Back then, during the Depression, that was big money. They came from all around, and the front yard would be covered up with cars." Robert noted that his father turned down cash and the offer of a good farm from men wanting to purchase Big Bill. A feed mill even made an offer to share royalties from the sales of their hog feed if he would say the huge hog consumed their brand of pig chow. "Dad wouldn't do it. He said it was raised on slop, sorghum molasses and potatoes." Eventually, Mr. Chappell decided to display Big Bill at fairs and drove him around in the back of a truck. "I don't know how long that went on, but he made good money with him," said Robert. "He was awful big to be moving around like that. Dad wound up selling half interest to a fellow here for $5,000 on credit." Then Mr. Chappell took a notion to show Big Bill at the Chicago World's Fair, but before he got the chance, tragedy struck. While the pig was in transport from Martin to Jackson, two men got to arguing over how much Big Bill weighed. Robert says the way he heard it the two were attempting to move the hog off of the truck onto a set of scales and in the process the critter fell and broke a leg, which spelled its doom. Reportedly, fever set in and the hog needed to be put out of his misery. The story of what happened next with Big Bill picks up with Kerry Butler's father, Bill Butler of Camden, whose father Buford Butler wound up with the stuffed hog and took it on the road for several years, mainly in the early 1940s. "This hog was on its way to Chicago and stopped at Wilkerson's Grocery in Jackson on Highway 70," began Bill Butler. "My dad, mother and sister were living there at the time. My dad bought the hog off the back of a truck. It was still alive at that time. "He called a taxidermist in town and made a deal with the taxidermist to stuff the hog. So they had him euthanized, and then he skint him and stuffed him." Evidently, the agreement between Buford Butler and the taxidermist went sour and resulted in a lawsuit won by Mr. Butler. And it seems until the suit was settled, the taxidermist kept Big Bill on exhibit in a garage into the late 1930s. Buford Butler worked in construction and, in between jobs, was a candy salesman in Jackson. While working in Columbia, Tenn., he purchased a stuffed, two-headed Holsteincalf and a live miniature mule named Queenie that could perform tricks such as smoking a cigarette and drinking a Coca-Cola. His son Bill reports that Buford, whenever he was out of construction work, would pack up the three critters and the family would travel either with Johnny's United Shows or set up on carnival grounds. "He was a jack of all trades. He set up like an old 1940s show with big banners and put on a record to do the barking and then he motioned folks to come into the tent," said Bill. "My father got off the road in 1946. He planned to put the hog in a tourist court with a store and filling station that he was building. The hog was sitting in the filling station when my father died in 1947. "My mother sold the hog to a man, and I do not remember who it was, but he was from Paris, Tenn. I know that he did have a little show where he moved around and charged people to get in to see the hog, but he never had it in a carnival. I've had no success in finding anybody who knows where the carcass wound up," said Bill Butler. And that is where the trail ends for Big Bill, who, before he gave up the ghost, was reported to be about 9-feet long, 4½- to 5-feet tall and weighing 2,552 pounds.